Location: The Games Room normally! If you like a forage Pete, this is the forum to be on. Only joking, there are a few of us who are perfectly nice and sane. Good pictures, are they from this year? Loads of us. Not you and Mimborin though. What are you saying Cab is a pillar of the community, he was on Blockbusters for goodness sake. The larch boletes were from a well established plantation up in Cumbria, by the Eden. I think we found them on the last day in June. We see lots of them in North Wales too. They seem to like mossy banks under larch, and warm, wet weather. The Larch Boletes look very similar to Slippery Jacks S.luteus. A Polish friend showed me that with those as long as you peel the slippery skin off first, you can then successfully hang slices on thread (use large darning needle) and dry over boiler or wherever, as with other non-slimey boletes. If you don't peel the skin, they just turn to mouldy mush, I found. looking through the gallery noticed that there were no pics of St Georges (Calocybe gambosa) so here is a picture of some I found in April. Found these on a grass bank beside a road near Plymouth. One of the few spring time mushrooms & darn tasty it is too. Can you identify this mushroom seen recently in oak woodland? 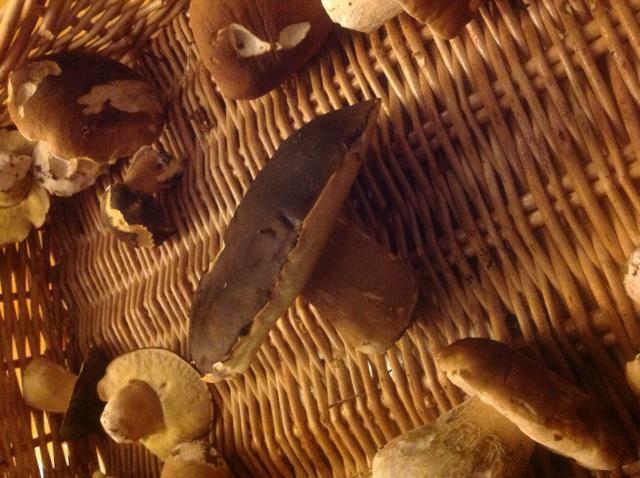 Boletus aereus, the Dark Cep. 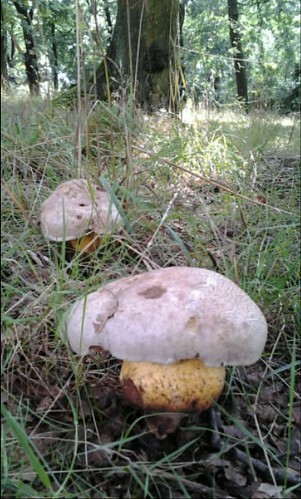 Far less common than the normal Cep, though found in the same habitat at the same time of year. Dark brown cap, stipe is shorter, darker & oval rather than round cross-section. Flesh white, pores same colour as Cep. Very tasty.